Search Results for "stand up paddle boarding"
Man Couple Stand Up Paddle Boards River Kauai Hawaii 4K 1353. Stand up paddle surfing and stand up paddle boarding is a offshoot of surfing that originated in Hawaii. Outdoor sporting activity. Stand Up Paddle Board Hanalei River Kauai Hawaii 4K 1352. Stand up paddle surfing and stand up paddle boarding is a offshoot of surfing that originated in Hawaii. Outdoor sporting activity. Aerial drone shot. View of corals from a bird's eye view. Surfers stand up paddle boarding. The camera looks down and flies forward slowly. Turquoise water of the Caribbean Sea. Riviera Maya Mexico. RIBCEV LAZ, SLOVENIA - SEPTEMBER 01, 2017: Stand up paddle boarding on lake Bohinj, popular tourist travel destination for outdoors pursuit in Slovenia. 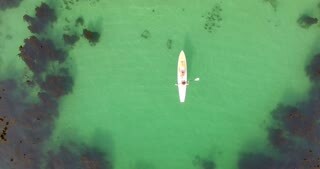 Unrecognizable group of people stand up paddle boarding on sea water surface for sport, fun, leisure or recreational pursuit. Enjoying summer SUP activity for holiday vacation.